A miniature LEGO alien and its cosmic pet kicked ofif the toy company's minibuild building events in January 2015. It is one of several recent space-themed LEGO kits to be featured. If you are a parent of a little LEGO fanatic like me, chances are you've been to a LEGO store recently for a free monthly mini-build event, or a LEGO Club meeting. Recently, the brick-building toy company has hosted some space LEGO events that have delighted my 6-year-old daughter to the point I had to share: Case in point, this adorable LEGO alien and its trusty pet. The green LEGO alien (because aren't aliens always green?) 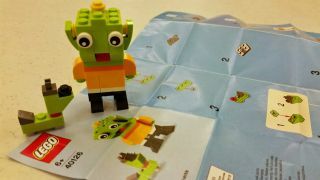 and space dog were the focus of LEGO's mini-build event in early January, as well as the monthly LEGO Club meeting. My daughter Z. says the best part of this 55-piece model is the alien's little yellow "hat" (actually a single, round yellow stud), though I have to admit I'm partial to the dog, myself. My daughter also loves that you can turn the alien's ears from down to up "so that it can pay attention." It's an open secret that I love all things space, and to be able to share even part of that with my daughter while she builds whatever she dreams up is a joy. Right now, LEGOs are her passion and the mini-build events are practically mandatory. Small space-themed LEGO building kits seem to be on a roll. On Tuesday (Feb. 3), the February 2015 minibuild will be a small space shuttle. Last November, it was a super-cool red and white LEGO rocket.